Tessa is our baby. She's two years old and loves to play fetch. Tennis balls are her favorite but she'll fetch anything. Loves to play and will tell you when she wants you to go out and play with her. Tessa is such a beautiful German Shepherd puppy. Thanks so much for sending in this great picture. 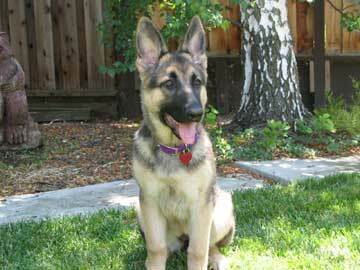 She is gorgeous now and will be quite a stunning German Shepherd when she is full grown.